All workshops take place in Dufftown, Moray, Scotland. Class numbers are limited to 4 and you are welcome to book individually or in group. Please contact me if you would like more information or to make a booking. Once booked I will be in touch with directions to get here. You are most welcome to come along to The Loft Gallery, St Margaret's Hope, Orkney to enjoy a glass of wine and view an exhibition of mixed media work by me and porcelain work by my long time friend and GSA buddy Ellie Bartleman. So looking forward to it and hope you can make it too..! Guest viewing Sunday 12th July between 12pm and 5pm - refreshments and nibbles. Everybody welcome to view the exhibition and meet the artist. I will be near at the Greentree Arts Studio, Fearness, near Nairn for another weekend textile workshop - Saturday 16th May and Sunday 17th May. Once again this is a hands on and fun series of textile workshops including: Day 1 - Tray and jar dyeing, shibori/tie dye and dabu mud resist techniques & Day 2 Heat transfer printing techniques. all techniques are suitable for complete beginners. I'm taking part in an exhibition of my art and textile craft work at The Old Waiting Room Gallery, Colinsay, alongside Anne Ferguson (glass and textiles) and Carol Paterson (painting and prints). We open on the Sunday night (26th April) but and the exhibition lasts until 2nd May but a selection of our work will be on show throughout the festival. 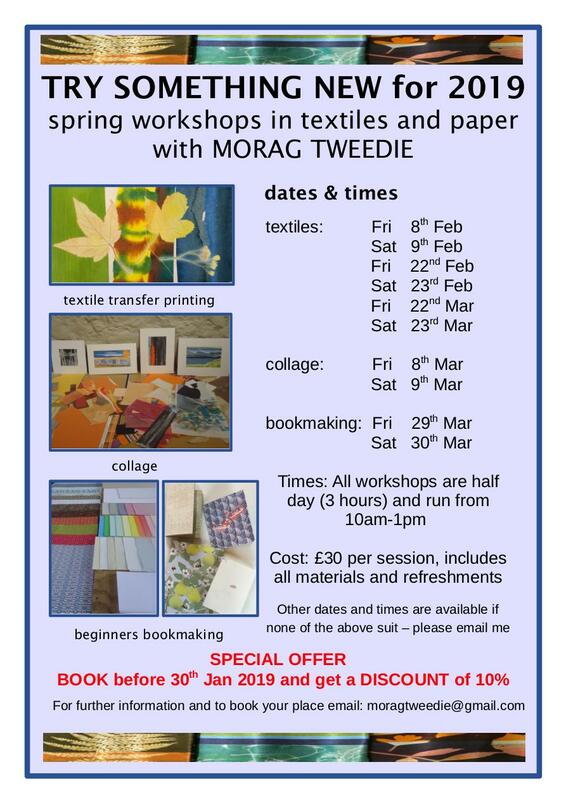 I'm delivering textile workshops in through the Cromarty Arts Trust over the weekend of 18th and 19th April starting at 10am and finishing at 4 pm each day. These are simple techniques suitable for complete beginners and are great fun! Cromarty Arts Trust - Ardyne Studio, Cromarty.